Don’t miss out on the opportunity to have your soil tested for parasitic nematodes and charcoal rot at no cost for Tennessee Farmers ($15 fee for out-of-state samples). This fall, the Plant Pathology lab at the West Tennessee Research and Education Center (WTREC) is continuing a survey of soil across the state to evaluate the populations of nematodes and charcoal rot in production fields. These soilborne pathogens are silent yield robbers as they can decrease yield even if above-ground symptoms are not observed. It is important to understand the population levels of these pathogens prior to the growing season in order to determine if management will be necessary and if management practices are influencing changes in the populations. While UT has always offered free screening of soybean cyst nematode (SCN) (Image 1) to all Tennessee farmers, we are expanding our free screening this year to include dagger, lance, lesion, ring, reniform, spiral, sting, stubby-root, stunt, and root-knot nematodes. Free testing is supported by the Tennessee Soybean Promotion Board funding. If you suspect nematodes in your field or are wondering about low yielding areas of your fields, then you can’t afford to ignore this opportunity to get your soil tested. Additionally, charcoal rot is caused by the fungal pathogen Macrophomina phaseolina and has a broad host range that includes both soybean and corn. 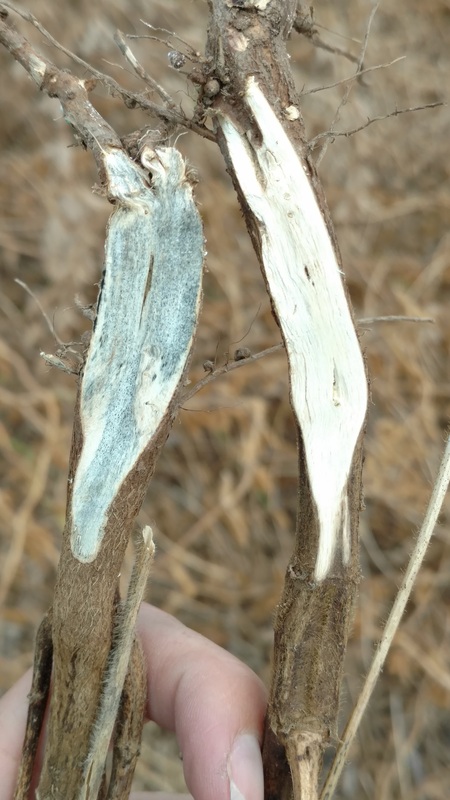 This fungus produces small spherical structures within the plant tissue called microsclerotia (Image 2) that overwinter in the soil and provide inoculum for crops planted in the spring, cutting into yield even in good moisture years and under irrigation. Best to sample in the fall, after harvest but before first freeze. Choose a time when soil is moist so that it is easily removed with a soil probe and angle probe 45 degrees off of row to sample around root zone. Collect 15-20 cores, 1-inch diameter and 6-8 inches deep, for every 20 acres sampled. Need at least a quart of soil for a sample. Sample a field in one of three ways: a zigzag pattern, targeting management zones, or targeting high-risk areas. Place sample in a quart or gallon zip-lock bag, keep it cool in a cooler or fridge, and send it to our testing lab the same day or ASAP for analysis (see address below). Fill out form found here and send it in with sample (form also has sampling instructions as outlined above). After samples are received and processed, our lab will communicate nematode results via email. Charcoal rot analysis will be part of a larger study this fall at WTREC, and those results will be available later this year. For more information contact your local county agent or Heather Kelly, Plant Pathologist (UT), by email (youngkelly@utk.edu) or phone (731-425-4713). Image 1. 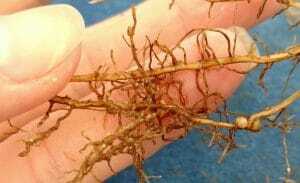 Soybean cyst nematode-infested root. Cysts (the female nematode) are the smaller round structures while the larger nodules are on bottom right of root mass. Image 2. Charcoal rot in root on left showing microsclerotia while root on right is healthy, non-infested.